Gumball and his friend are going to deliver a plate with a fresh meal, but there are lots of things that can happen. Help him to avoid all obstacles. 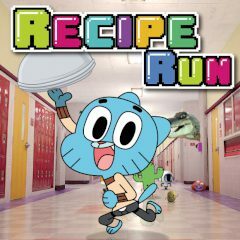 Gumball has an important mission today, because many of his friends want to have a bite of a tasty meal. Well, send it to them until it gets cold. Run towards the finish as mad and make sure you will avoid all traps and obstacles.